Domingo Parada Farjat Bolivian-American Artist born in 1941 in Sucre, Bolivia. Studied Art at the Universidad de San Francisco Xavier of Sucre, Bolivia. Attended classes at the Museo de Arte Moderna of Rio de Janeiro, Brazil with Brazilian artist Ivan Serpa. Considered a pioneer, and one of the most important figures in contemporary art in Bolivia he moved to the U.S in 1966 where he continues his creative career. He has exhibited his work more than fifty times in Bolivia, Argentina, Brazil, Paraguay, Chile and several states in the U.S. His paintings form part of the private collections in several countries in South America, Europe, the U.S and Asia. His work also figures in cultural institutions like the Museo Charcas, Sucre, Bolivia, the Museo de Arte Moderna, Rio de Janeiro, Brazil, the Pan-American Union, Washington D.C., U.S.A., The Phillips Collection, La Paz, Bolivia, El Diario Collection, La Paz, Bolivia, Centro Boliviano-Americano, Cochabamba, Bolivia, Centro Boliviano-Americano, La Paz, Bolivia, Centro Boliviano-Aleman, La Paz, Bolivia and Universidad Tecnica de Oruro, Bolivia. 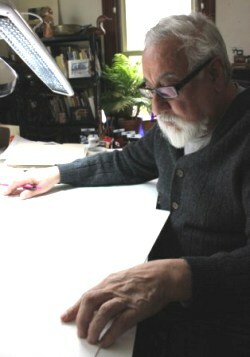 He represented Bolivia at III Biennale de Arte Americano, Cordoba, Argentina in 1966. He received an Honorary Mention in the 1965 Salon Nacional Phillips, in La Paz, Bolivia. In 1969 he received an Honorary Mention at the "Art & Soul" Exhibition in Chicago. He also received an Honorary Mention in the 1959 Poster Competition for the 350th anniversary of the Archbishopric of La Plata, Sucre, Bolivia. He received a First Prize at the 1963 Competition of the School of Medicine, University of San Francisco Xavier, Sucre, Bolivia, and the1964 Gauguin Group of Ceara, for his artistic work in Brazil. In 1969 he received The Davina Wilson Prize at The 15th Annual Exhibition of The Society of Painters in Casein, New York City, U.S.A. In 1970 he was given The Fabian Zacone Prize by The 29th Annual Exhibition of The Society of Painters and Sculptures of New Jersey, Jersey City, U.S.A. In 1971 he was given the M. J. Kaplan Prize at the 17th Annual Exhibition of The Society of Painters in Casein, New York City, U.S. A. In 2012 he won the Visual Arts Society Award in the 33rd Annual Mini Works on Paper Exhibition at Jacksonville State University, Jacksonville, Alabama. In 2013 he received Third Prize at the Colorful Compositions Exhibition ,Leading Artists Online Gallery. U.S.A.
1957- Salon Municipal. Tarija, Bolivia. 1963- University of San Francisco Xavier. Sucre, Bolivia. 1963- University of San Andres. La Paz, Bolivia. 1964- Cafe Europa. Rio de Janeiro, Brazil. 1964-Group Exhibition-"Distinguished Artists of Sucre". Women's Circle of Spanish Culture. 1965- Permanent Salon of Fine Arts. Sucre, Bolivia. 1965- Bolivian-American Center. Cochabamba, Bolivia. 1966- Group Exhibition-" Bolivian Fine Art". Bolivian-American Center, La Paz, Bolivia. 1966- Salon Municipal. The Goethe Institute. Sucre ,Bolivia. 1966- Salon Municipal, Department of Culture. Sucre ,Bolivia. 1966- Cafe Gijon. The University of Technology of Oruro. Oruro ,Bolivia. 1966- Bolivian-German Cultural Center. La Paz, Bolivia. 1966- Bolivian-American Center, with American Artist Anthony Landreu.Cochabamba, Bolivia. 1966- III Biennale of American Art, representing Bolivia. Cordoba, Argentina. 1966- Salon Municipal, Department of Culture. Sucre, Bolivia. 1966- "El Diario" Gallery. La Paz, Bolivia. 1966- ILARI Gallery. The Museum of Modern Art and The Latin-American Institute of International Relations. Asuncion, Paraguay. 1967- Hyde Park Federal Savings and Loan . Chicago, IL. U.S.A.
1968- Amos Stagg High School. Palos Hills, IL. U.S.A.
1968- Chicago State College. Chicago, IL. U.S.A.
1969- The Pan-American Union. Washington D.C. U.S.A.
1969- Group Exhibition- "Artists of Chicago". De Paul University. Chicago, IL. U.S.A.
1969- University of Illinois. Chicago Campus Circle, U.S.A.
1969- Group Exhibition. 28th Annual National Exhibit, The Society of Painters and Sculptors of New Jersey, Jersey City, NJ. U.S.A.
1969- Illinois Institute of Technology. Chicago, IL. U.S.A.
1969- Container Corporation of America. Chicago, IL. U.S.A.
1969- Group Exhibition- "The Artists Guild of Chicago" Chicago, IL. U.S.A.
1969- Group Exhibition-"15th Annual Exhibition, The National Society of Painters in Casein", New York, NY. U.S.A.
1970- Group Exhibition- "Frontal Images", The Mississippi Arts Association, Jackson ,MS, U.S.A.
1970- Group Exhibition-"16th Exhibition, The National Society of Painters in Casein". New York, NY. U.S.A.
1970- Group Exhibition- 29th Annual Exhibition. The Society of Painters and Sculptors of New Jersey. Jersey City, NJ. U.S.A.
1971- Group Exhibition-"17th Annual Exhibition, The National Society of Painters in Casein", New York, NY. U.S.A.
1978- Group Exhibition-8th Annual Exhibit of Small Paintings. New Mexico Art League. Albuquerque, NM. U.S.A.
1978- Group Exhibit- 9th Annual Exhibition. The Lawton Junior Service League. Museum of Great Plains. Lawton, OK. U.S.A.
1978- Group Exibition-7th International Exhibition. Brownsville Art League. Brownsville, TX. U.S.A.
1978- Group Exhibition-"The Artist Guild of Chicago". Chicago, IL. U.S.A.
1978- 19th Annual Exhibition. Great Fall River Art Association. Massachusetts, U.S.A.
1986- Group Exhibition-UNIART. Santa Cruz, Bolivia. 1987- Group Exhibition- Cultural week "Buenos Dias Santa Cruz". Santa Cruz, Bolivia. 1987- Group Exhibition- "Artists of Santa Cruz". Casa de la Cultura Santa Cruz, Bolivia. 2012- Group Exhibition –Postcard Legacy Campaign Exhibit. Colorado Mesa University. Grand Junction, Colorado. U.S.A.
2012- Group Exhibition- 33rd Mini-works on Paper Exhibition. Jacksonville State University Jacksonville, Alabama, U.S.A.
2012- Group Exhibition- 82nd Annual Juried Open Exhibition. National Art League. Douglaston, NY, U.S.A.
2012- Group Exhibition- 58th Annual Exhibition. National Society of Painters in Casein and Acrylic.Inc. New York, NY. U.S.A.
2012- North Central College, Oesterle Library Gallery, Naperville, IL. U.S.A.
2012- Group Exhibition- “5x5(x5)” Target Gallery, Torpedo Factory Art Center. Alexandria. Virginia. U.S.A.
2013- Group Exhibition-“Evocative”, Christopher Art Gallery. Prairie State College, Chicago Heights, Illinois. U.S.A.
2013- Group Exhibition-34rd Annual Mini-works on Paper. Jacksonville State University Jacksonville, Alabama. U.S.A.
2013- Group Exhibition-Paper Works. Upstream Gallery. Dobbs Ferry, New York, USA. 2013- Group Exhibition- Works on Paper NYC II. Jeffrey Leder Gallery ,New York, New York, USA. 2013- Group Exhibition- Suenos Americanos. Workhouse Arts Center, Lorton, Virginia, USA. 2013- Group Exhibition- Small Works 2. Jeffrey Leder Gallery, New York, New York, USA. 2013-Group Exhibition-Colorful Compositions Exhibition, Leading Artists onli9ne Gallery. USA. 2013-Group Exhibition-Lisbon International Contemporary Exhibition, Meeting Art Gallery, Lisboa, Portugal (Represented the USA with to other artists). 2013- Group Exhibition- IAEOU. Chicago, Illinois. U.S.A.
2013- Group Exhibition- 37 Beverly Art Competition & Exhibition. Beverly Arts Center. Chicago, Illinois. U.S.A.
2013- Group Exhibition- “City of Tiny Lights” International Exhibition. Salisbury University Galleries. Salisbury, Maryland. U.S.A.
2013-2014- Group Exhibition- “It’s Small” . Fredericksburg Center for the Creative Arts. Fredericksburg, Virginia. U.S.A.
2014- Group Exhibition-“Small Works Exhibition”. Upstream Gallery. Dobbs Ferry, New York. U.S.A.
2014-Group Exhibition-“ Downtown Chiado 14”International Contemporary Art Exhibition. Lisboa, Portugal. Representing the USA. 1959- HONORARY MENTION-Poster competition for the 350th anniversary of the Archbishopric of La Plata. Sucre, Bolivia. 1963- FIRST PRIZE-Art Competition. The School of Medicine. University of San Francisco Xavier. Sucre, Bolivia. 1964- FIRST PRIZE- Gauguin Group of Painters of Ceara .For his artistic work in Brazil. Ceara, Brazil. 1965- HONORARY MENTION-Salon Nacional Phillips. La Paz, Bolivia. 1966- HONORARY MEMBER-For his artistic work. The Goethe Institute. Sucre, Bolivia. 1969- DAVINA WILSON PRIZE-15th Annual Exhibition. The National Society of Painters in Casein. New York, NY. U.S.A.
1969- HONORARY MENTION- "Art and Soul" Exhibition. Chicago, IL. U.S.A.
1970- FABIAN ZACONE PRIZE- 29th Annual Exhibition. The Society of Painters and Sculptors of New Jersey, NJ. U.S.A.
1971-M.J. KAPLAN PRIZE- 17th Annual Exhibition. The National Society of Painters in Casein. 2012- VISUAL ARTS SOCIETY, JSU AWARD-33rd Annual Mini-works on Paper Exhibition ,Jacksonville State University, Jacksonville, ALABAMA. 2013- THIRD PLACE-Colorful Compositions Exhibit, Leading Artists online Gallery. USA.